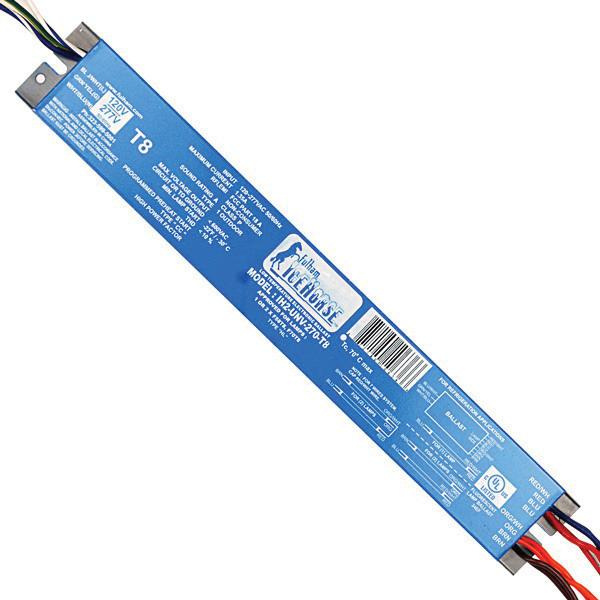 Fulham IceHorse™ Universal voltage low temperature electronic ballast is suitable for use with two 157-Watt F70T8 lamps. It has voltage rating of 120/277-Volt AC and current rating of 1.31-Amps. This C62.41 ANSI coded ballast features painted steel case construction. It provides Class P protection. This ballast has parallel lamp connection circuitry. It operates at the frequency rating of 50/60-Hz. This ballast with programmed preheat starter, has power factor greater than or equal to 0.9. It measures 12-Inch x 1.7-Inch x 1-Inch. This ballast withstands temperature rating of 70 deg C. This dynamic ballast automatically syncs/adjusts in cold temperatures to provide optimal light output. Ballast is UL/cUL listed and meets ANSI standards.